Justice and Democracy for Nicaragua. | Flickr - Photo Sharing! 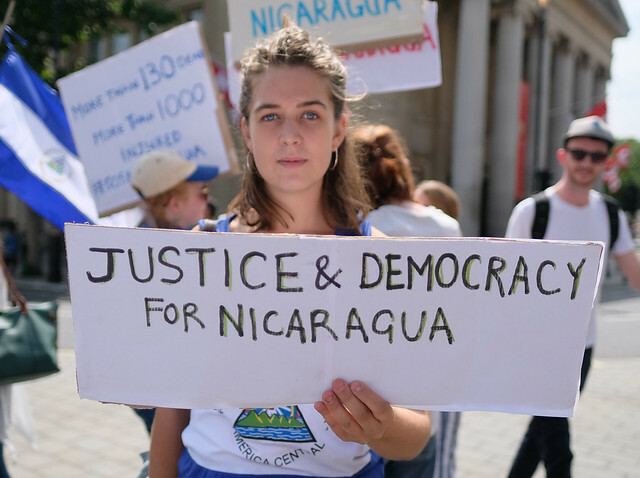 Justice and Democracy for Nicaragua. Protesters in Trafalgar Square attempt to mobilize support in Britain for opposition to the autocratic rule of Nicaragua's president, Daniel Ortega, who is backed by big business and foreign investors. The state has taken increasingly repressive measures since it was suspected of fixing last year's general election results. More than 120 people have been killed in the last two months during police operations to quell a popular uprising. One journalist was shot dead while broadcasting on Facebook live. Since protests gained momentum at the end of April, Ortega has been compared to Nicaragua's former US backed dictator Somoza who was overthrown by a socialist revolution in 1979. After seizing power, the left wing Sandinastas carried out their promise to implement welfare, health and agrarian reforms even as the United States imposed an economic strangulation of the country and deployed proxy terror forces (the Contras) in an attempt to overthrow the government. In an illuminating legal decision in 1986 the International Court of Justice ruled that the United States should pay Nicaragua reparations for the massive human and economic cost inflicted on it by the US terror campaign in violation of international law. However Washington used its veto in the Security Council to block any enforcement of the judgement. This photo was used in the following online publication. Meon Valley Photos., and 30 other people added this photo to their favorites. Thank you VERY MUCH for your superb documentary picture. I love how innocent and peaceful her face is!